Alghero offers myriad testaments to the presence of mankind in the local area for many thousands of years. Among the sites of greatest interest are the Grotta Verde, the Grotta della Dragunara, the Necropolis of Anghelu Ruju, the Villa of Sant’imbenia and the bridge over the Calic basin. 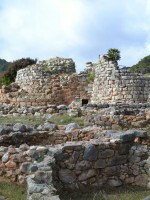 The nuragic period, which is represented by around 100 nuraghi scattered across the area, is shown at its most monumental in the nuragic palace of Palmavera. On the road towards Porto Conte you will come across Palmavera, a pre-historic village of around 50 conical-shaped stone huts surrounding a central palace-tower that retains its “false cupola” vaulted ceiling. The village was constructed around 1100 B.C., with other towers being added over the following 300 years. The settlement encapsulates the various phases of the social life and political organisation of the tribal community; in this regard, the “meeting hut”, which was used for debates and religious practices, is particularly interesting. On the road towards Porto Torres, around 9 km from the city, you come to the pre-nuragic tomb complex of Anghelu Ruju, a necropolis of 38 pre-historic underground chambers carved out of the rock. It is undoubtedly one of the most important archaeological sites in the Mediterranean. At the entrance to a number of the tombs, you can see carvings in the rock showing “boat-shaped” taurine protomes, which indicate that the tombs were places of worship. 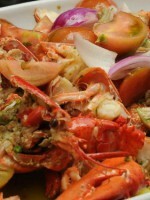 Like the rest of Sardinia, Alghero has a strong culinary tradition, the distinctive feature of which is its blending of Catalan and native Sardinian cuisines, artfully combining the vegetables from its abundant fields with the catch from its generous waters, all accompanied by wines made using grapes cultivated in the local vineyards. - Our Lady of Valverde: the pilgrims walk to the church of Valverde. - Rally Italia Sardegna 2016 (10-12 June, 2016) – a stage of the World Rally Championship. - Feast Day of Saint Elmo: a procession of boats carrying a statute of the saint. - Cap d’Any d’Alguer, Christmas and New Year celebrations.